As longtime practitioners/teachers of yoga and qigong, this husband/wife team, have been working with unroasted cacao for over 11 years, creating delectable, superfood-enhanced treats, while observing and experimenting with its physical and metaphysical properties. Their concurrent study of herbalism and human energetics of various traditions has led them to a profound and unique perspective in the use of cacao as a sacrament, elixir, and catalyst for inner alchemy and higher consciousness. A strong, sacramental cacao elixir will be served as Aradhana and Truth-I weave together a synergistic musical, meditative, energy cultivation experience of ceremonial chocolate, music and prayer! We have observed that chocolate, and especially a strong brew of cacao, made with love and intention opens gateways in the human heart and spirit, and when combined with inward contemplation, reflection on the inner light, and fellowship in a safe container, it proves a warm and gentle catalyst to greater states of gratitude, compassion for Self and others, forgiveness, and peace. This can be an opportunity for channeling creativity, opening to ecstatic states, freeing our voices and connecting to the energies of the heart-fire. With the assistance of the Cacao medicine we are enabled to journey more deeply into our heartspace to connect with each other and Source energy. Each ceremony is unique, but there will surely be singing, silence, listening, accessing inner wisdom, and opportunity to commune with self, higher self, and each other. All feelings are welcome in this safe, sacred container harnessing the potential for great growth and love. Gorgeous painting gifted to us by dear friend and fellow chocolatier, Brynda Bechtold. 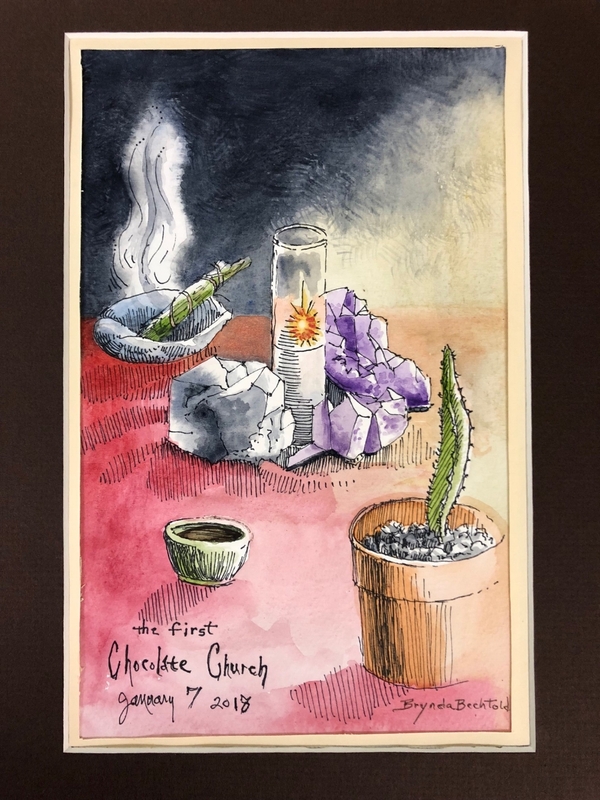 She sketched this drawing of of our alter during the very first Chocolate Church gathering!